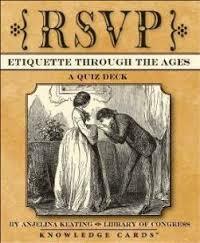 Proper etiquette seems to be warily regarded by some modern Americans, much to the detriment of all. There is nothing weak about having good manners; quite the contrary. Real men are, invariably, polite men, and the same can be said of real women. America's bravest men and women - Washington, Jefferson, Lee, Tubman and others - have always been America's most considerate. Rudeness and a lack of civility are traits that go hand in hand with weakness of all sorts, especially weak-mindedness, and we should do our utmost to avoid such behavior. Our belief is that there is a misunderstanding about good manners. Having good manners does not mean engaging in ridiculous fussiness. Having good manners means, first and foremost, that one conducts oneself with thoughtfulness and consideration for others. useful guides to the performance of our duties." civility to a bear than their money to a bankrupt." side, make not thy desire loudly known, but wait patiently till it be offered thee." indifferent, for that is silly." The Laws of Etiquette - This etiquette guide from 1836 by "A Gentleman" offers a great deal of food for thought in modern times. Flag Etiquette - For Proper Display of American Flags. Kindness - Advice from an early 20th century writer, still pertinent today. Hints on Writing Love Letters - For Affairs of the Heart, and Advice on Marriage.